Lucon is situated on the borders of the Marais Poitevin, Bas Bocage and the prairie of Lucon-fontenay, it was once a sea port and was on the Roman road from Les Sables d,Olonne to Niort. The Alluvial deposits did not start silting up the gulf of Picton till the 10th century, the harbour in Lucon was in use until 1924 though this was only made possible by the draining of the marshes by the Benedictine monks and later the Dutch. The town was plundered by the Normans in 846 and again in 853 by the Viking chief Hastings. Another Viking chief was recruited by the Count du Poitier to recapture the town and after a short siege Hastings negotiated a safe passage burning the town as he left. The Cathedral of Lucon dominates the skyline for miles around, the spire at 85m high is the pinnacle of this great cathedral which is built in several styles on the site of a 12th century Romanesque church. Very little remains of the original church except the gable end of the north transept and part of the south transept. There is a gothic nave with two aisles,14th century Choir and a Renaissance chapel. The facade is 17th century by Toscane who also worked at St Michel en Herm and Fontenay le Comte. 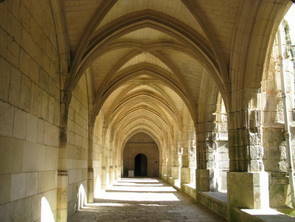 The three sided cloister that joins the bishops palace to the cathedral is from the Renaissance period. The organ by Cavaille-coll was presented to the cathedral by Napoleon 111. In 1871 M. dumaine gave the town an attractive park which can be found behind the Marie. Lucon is ideally situated for discovering many of the attractions of the south and west Vendee including; the cote Luminiere, the marais poitevin, the Praire of Fontenay-lucon and the bocage, it has good communications both by road or rail. Lucon is regarded as the spiritual capital of the Bas Poitou with the original monastery founded by St.Philbert in the V11e. In 1317 Pope John XX11 decreed Lucon a Bishopric with a bishops palace and cathedral. The most famous bishop was Armand du Plessis who at 23 was appointed bishop in 1608, he declared Lucon "the vilest, muddiest and most unattractive bishopric in France” as the town had never recovered from the wars of religion. Armand du Plessis who later became Cardinal Richelieu and later still the 1st Minister under Louis X111 set about regenerating his diocese with the rebuilding of churches, the cathedral and his palace, he also founded a college and hospital in the town. 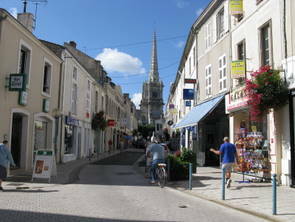 Today Lucon is a thriving country town with a population of 10,000. Its main industries are Agriculture, tourism and building mobile homes. There are numerous Restaurants, bars and cafes as well as shops and supermarkets and the town has a bustling yet relaxed atmosphere with a very French feel to it. Jardine Dumaine. Behind the Maire this attractive garden built on the site of old Capuchin convent was given to the town by the Dumaine family after whom it is named.This park has an avenue of 170 year old Yew trees, clipped and over 7m high. The lake with is ducks and geese is always an attraction for children as are the living statues of animals from the fables of La Fontaine. 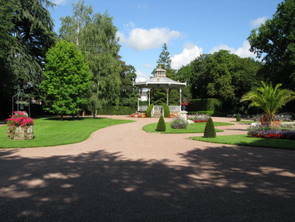 All around the wrought iron bandstand which is decorated with bronze naiads are colourful flower beds. This park is a perfect diversion for all the family. Lac des Guifettes. This lake is the centre of activities both on the water and ashore and is 3 kms west of the own. Magnil-Reigniers. Lying just west of Lucon this small village is best known for St Nicolas Church (XII century) and its Priory (XIV century). The church was burned by the Normans in 853, together with the Cathedral of Lucon. It remained until the 12th century when Saint Nicolas is rebuilt in the Romanesque style. In the 14th century, it was decided to raise the center of the church, adding the bell tower. The Priory collected the Royalties that where paid to the diocese. An attractive little community well worth a short detour. Photos of Magnils-Reigners. Camping; Atlantique Pellerin Vacances. Le Haut Dore. Tel 02 51 56 08 78. Camping le Cle des Champs, La Papotière, Beugné l'Abbé Tel.02 51 56 29 06. Bike Hire; Domaine des Guifettes. Route de l'Aiguillon. Tel. 02 51 56 17 16. Taxis; Taxis Charpentier. 1 Bd Michel Phelpon. Tel. 09 75 83 69 42.